Young and talented natural winemaker, Ivan Kosovec is working on a revival of of Škrlet, an indigenous varietal of the region of Moslavina. It was a vine that only grows in this hilly area and nowhere else in the world, the grape is an unknown varietal outside of these regional walls. The grape has tiny red “freckles” so Skrlet is derived from the German word “scharlach”, meaning a speckled or dotted surface that are reminiscent those of a Scarlet fever rash. Driven by his passion on hands off winemaking Kosovec made this ordinary, almost forgotten, table grape into something extraordinary not only reviving the planting of more vines but also the elevation of taste and structure of days past. 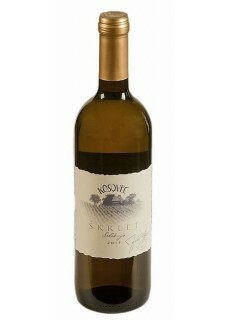 Škrlet is the perfect refreshing wine, with good natural acidity, great balance and high minerality in combination with beautiful nose which resembles of meadow flowers, honey, lime-tree, a hint of light spices and citrus finish. Food pairing: Fish, or veal, goes very well with octopus salad .